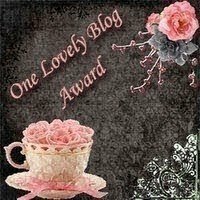 Friend and fellow author Marian Allen honored me today by giving me a One Lovely Blog Award. Thank you, Marian! I do consider this an honor, but to be honest I usually shy away from any kind of "chain". And now I'm going to be a bad girl. I'm going to change the rules a bit. Instead of listing 15 blogs I like (I like far too many! ), I'm going to let you click on Marian's name above and visit her blog. She's a fabulous writer and I'm sure you'll enjoy her work. I'm in the middle of my Cherish the Romance Virtual Book Tour and on my blog every day I've listed the blog stops on my tour. These are some of my favorites, and there's far more than 15. More like 115! To check them out just scroll down on my blog or you can do a search for "cherish the romance" in the blogger search bar.